Be My Valentine Deluxe/Premium in Southern Pines, NC - Hollyfield Design Inc.
Be My Valentine Deluxe has everything to say I Love You! 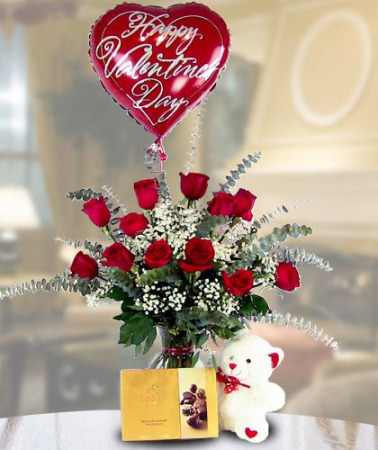 One dozen red roses - or color of your choice - delicious box of chocolates, plush animal, and Valentine mylar balloon. $160 Premium option features TWO dozen roses, box of chocolates, plush animal, and Valentine mylar balloon. 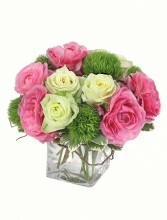 Cube, compact arrangement features roses, hydrangea, curly willow - colors based on availability. Create some Valentine's Romance with our Romance Package. Package includes 1 dozen red roses (or color of your choice), 1 delicious box of chocolates, 1 adorable plush animal, and 1 bag of rose petals! 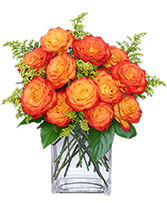 The perfect way to say I Love You on this day and always!